Inking Aloud: Hang Ten, Dude! The theme for this month's TCP Tuesday challenge at The Cat's Pajamas is summer. I inked up one of TCP's summery big-eared bunny images for this fun design. I colored up the surfing bunny from the Stoked stamp set with Copic markers, then cut out the colored image with my Brother Scan 'n Cut. 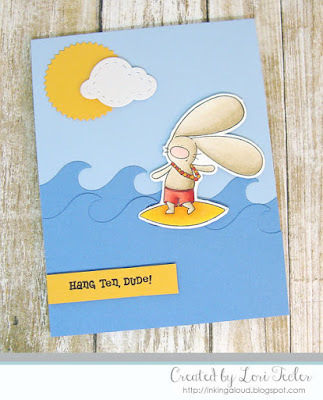 To make a watery background for the bunny, I used the Wave Border die to cut waves into two blue cardstock panels. I adhered the panels to a lighter blue card base on an angle, then set the bunny on top, using foam tape for dimension. To fill in the scene, I added an orange pinking circle sun and a shimmery white stitched cloud, cut with TCP's Stitched Clouds dies. 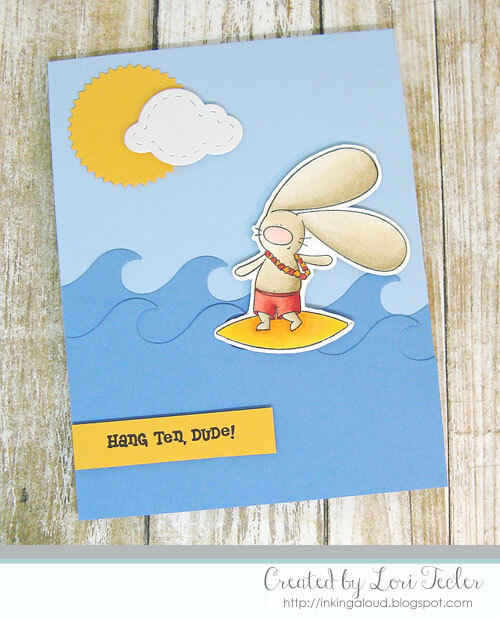 The "hang ten, dude" sentiment was stamped in black ink on a narrow orange strip to match the sun and the bunny's surf board, then adhered to the bottom left side of the cardfront using foam tape. Really cute Lori! So glad to see you participating in the TCP Tuesday challenge.